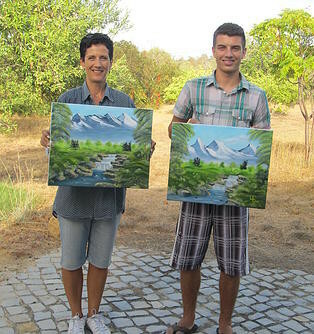 Workshop - joyfulpainting-algarves Webseite - Oel-Malkurse klassisch und nach Bob Ross! Have you ever wished you could paint but did not know where to begin ? 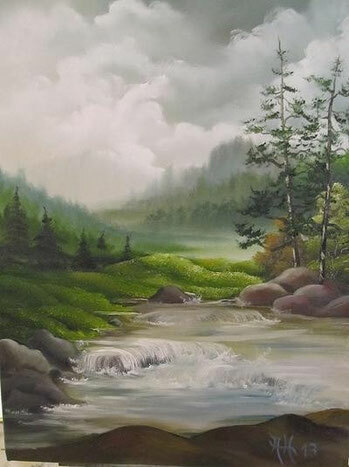 The wet-on-wet technique is designed to enable anyone to paint and create some wonderful pictures, even if you have never painted before. You do not even have to be able to draw! The wet-on-wet technique is the application of wet paint on top of wet paint without sketching, omitting the traditional technique of waiting for each layer to dry. I teach easy “step-by-step” painting and after a few hours your picture is finished and ready-to-frame. You create from your own talents in just few seconds skies, clouds, trees, lakes, waterfalls of flowers. Odorless oil-paint and thinner allows one even to paint at home. It is so easy – try it yourself ! There are no secrets behind it ! You can do it too. I will help you ! You have nothing to buy! Take a painting class and realize your dreams. You paint in my studio and I carefully show the students this astonishing painting technique. You have nothing to bring except a smile and a positive attitude. “the more you practice the sooner the great painting success will come” (Attila Hauser). 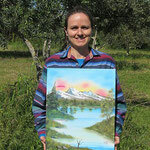 Choose under “PAINTING - MOTIVES” the picture you want to paint with me and email me 2 or 3 dates which you would prefer. 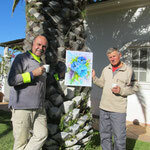 In a small group of maximum 3 people we are going to paint one motive per day. Everybody is painting the same subject but at the end every picture looks slightly different in terms of color, shape, mixture and personal "handwriting". I paint the same picture at the same time in front of you step-by-step and explain all the necessary details. Then you try and if necessary you will get my assistance. I will prepare the entire material which will be ready for you. The 1 day class costs € 70 and has to be paid in cash. Bring with you your second-handclothes, your lunch, a positive attitude and a big smile. No prior experience necessary – nor investment ! Even if you have never painted before ! We start at 9.30 a.m., take a 1 hour lunch break and finish around 4.30 p.m. I recommend to arrive around 9.00 a.m., in order to allow enough time to organize your workstation. There will also be a couple of tea breaks. 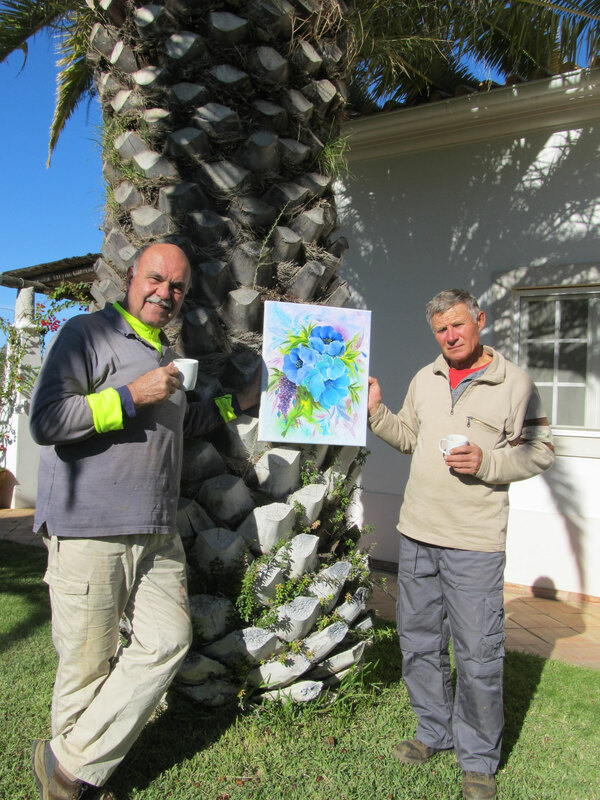 After only 1 day of painting you will take home a completed, ready-to-frame oil painting from your own talents ! The main goal of this workshop is to learn to paint correctly with all these means, in order that you can successfully paint any kind of landscape or flower you desire at your home. Anybody who already has done with me a 1 day class is welcome to join a 2 day workshop. It costs € 100 and all material is included. We don’t paint complete pictures. 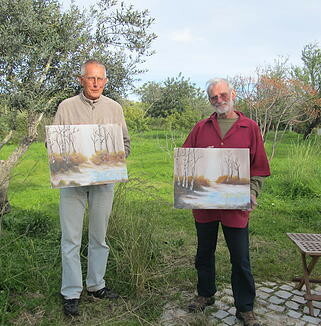 We learn in detail how to use the material and how to apply the wet-on-wet technique. On “second hand canvases” we train how to paint different skies, waters, woods, mountains, light sources or fantastic backgrounds etc.